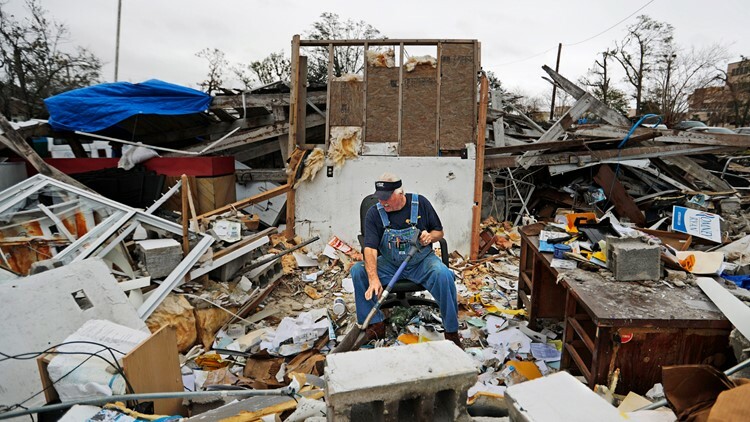 Patrick Muth sifts through debris in what used to be his office of his fifth-generation plumbing business he continues to operate in Panama City, Florida, Wednesday, Jan. 23, 2019. "You have two options," said Muth, who plans to rebuild the office. "You can lay down and cry or you can keep marching." Bay County had about 183,000 residents before the storm, and about 7,800 people were estimated to be homeless in January. PANAMA CITY, Fla. — Paulina "Bela" Sebastiao would give almost anything to be able to do a load of laundry without having to drive miles from her Mexico Beach home. Anthony Campbell would appreciate having a gas station closer than an hour away from his house in Parker. And Patrick Muth just hopes it doesn't rain when it's time to go to work: His "office" in Panama City consists of a desk surrounded by rubble under an open sky. Life is still a struggle in the county hardest hit by Hurricane Michael, which carved a wide swath of destruction through the Florida Panhandle when it roared ashore on Oct. 10 with winds of 155 mph. Drivers who have lived in the area for years second-guess themselves about whether they're going the right way — the street signs, trees, and houses that once served as points of reference are gone. Many doctors' offices haven't reopened and one of the county's two hospitals was closed, even though Bay County residents are experiencing hurricane-related health problems such as respiratory illness. Students in schools damaged by the storm have moved into other facilities, dropping enrollment by 14 percent. Bay County had about 183,000 residents before the storm, and about 7,800 people were estimated to be homeless in January. Shopping for groceries is burdensome since many retailers haven't reopened yet. Many of those that have are selling limited goods from pop-up trailers parked in front of their damaged properties. Garbage collectors aren't even close to removing the 15 million cubic yards of Sheetrock, insulation, tree limbs and appliances strewn everywhere by the storm. Amid such disruption, once-mundane everyday tasks now require a combination of planning, patience and luck. "It's just a hassle," said Campbell, who is retired. "With everyday life ... everything is different. You have to readjust." After Hurricane Michael destroyed the Mexico Beach house of Bela and Jaques Sebastiao, they lived in a tent in their front yard and then a camper. They recently received a trailer from the Federal Emergency Management Agency, but it took more than a month before they were allowed to move in since they needed a special tank for sewage. The trailer had a shower and not being able to use it for weeks was "torture," they said. The Sebastiaos, along with two other neighbors, were the only residents who had returned to their beachside street in Mexico Beach, where homes were either blown off their foundations during the hurricane or intentionally knocked down after the storm because they were deemed too damaged. Every two weeks, they drive hundreds of miles (kilometers) to their son's place in Georgia to do laundry. "We don't have any showers, no laundry, no supermarkets," Jaques Sebastiao said in the days before they could move into their trailer. In some cases, county residents have been hindered in their efforts to rebuild and repair. Mexico Beach — which became the poster child of the storm with its rows of empty cement foundations where houses once stood — had a moratorium on new construction until mid-February to allow new flood maps to be designed. Even with the green light to go ahead, residents are having difficulty getting commitments from in-demand contractors, said Campbell, whose home developed mold after a dispute with his insurance company delayed repairs. Principals and teachers at Bay County schools are on the lookout for students who are wearing dirty clothes or missing shoes. Northside Elementary School in Panama City was given industrial washers and dryers so students can get their clothes cleaned, and staffers have filled a broom closet with donated shoes and clothing. "We have so many students who are living from place to place and the faculty is living place to place," said Principal Amy Harvey. "Academics has to be important, but we want to make sure these kids are emotionally OK before we can teach them anything." Since his trucks weren't damaged, Muth kept operating his plumbing business with barely a hiccup, and he's already planning to rebuild his office space. But given the extensive damage to plumbing everywhere, his regular customers don't always realize it may take weeks before he can get to them. When making service calls, he calls ahead to make sure the roads are clear and there is gas available in the area. "It's just not going to be what it was for a long time," Muth said. "All of it has changed." For law enforcement, the biggest problems since the storm are the pervasiveness of unlicensed contractors and the illegal dumping of debris on the sides of roads. Otherwise, though, the hundreds of officers from outside agencies who came to Bay County in the weeks after the storm helped keep the crime rate down, said Bay County Sheriff Tommy Ford. Would-be criminals are perhaps discouraged by signs like the one on two wooden boards covering windows at R & D Auto Electric in Parker. They read, "Stay out. You look, we shoot!" "Make no mistake. Things are very tough here, and there are people who are living in very difficult circumstances," Ford said. "We are still hurting and we're going to be hurting for a long time."